Acquire skills for strategic leadership in just 9 minutes daily! Strategic Leadership e-Training Guide: Which are the most important topics for your individual case to learn?. 9 x e-mails for e-Mentoring, Questions and Answers. Quick Sylver Modules ( 9 Modules Prime Tech Theta Essentials ). GYM9 Trainings of 9 minutes. Strategic Leadership Archive e-Documents and e-books. Identification of actual skills and performance necessary for strategic leadership. Study of self-assessment workbooks, charts, score lines and standard. 9 e-Game Missions, to test proof the new skills. 9 Modules dedicated to empower your ability to learn online: learning by doing, playing, creating, self-observation, training. Perceiving, thinking, feeling, designing, doing, living out of the box. Emotional self-management, time & process management. Setting goals and designing process. Emotions, strategy design and self-awareness. Performing arts and body emotional self awareness. The arts of war, peace and love. Study of 9 levels of management (Prime Tech Theta Matrix 9+). Strategic Leadership in the Matrix 9+. Training with the Matrix 9+ Board Game. Peace, culture, family, life care and heritage. Human rights, ethics and modern leaders codex. Quantification of the Human Value. 1 x ONLINE SKYPE SESSION 45 min /month including e-mail based e-mentoring. Luis provides e-trainings on team building, community building, leadership and management based on nature principles, nature laws, self-awareness, meditation, yoga, martial arts since 1980. Between 2011 and 2016 he started two key projects in the field of peace, human rights, ethics, as well the series publications dedicated to his Legacy. In 2015 he announces a new stage of development with the integration of a tool dedicated to the quantification of the human factor value. 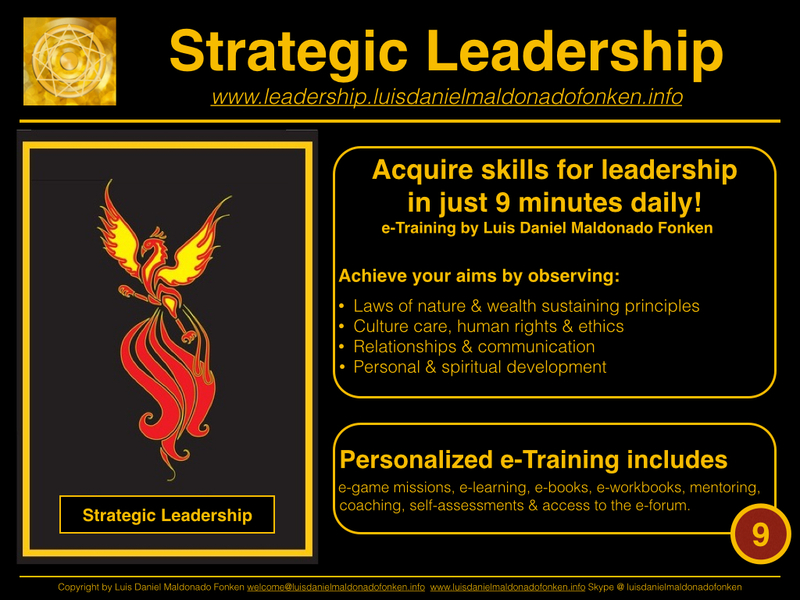 Strategic Leadership Training and Archive is the collection of experiences, projects, know how, methods, tools, trainings, practices for strategic leadership, developed and applied by LUIS Daniel Maldonado Fonken since 1980.